Love it! 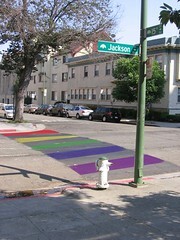 I was quite sad a few weeks ago when I drove through there and saw that they had painted over the guerrilla crosswalk. Didn’t it cost more to paint over it than to paint it in the first place? And it is definately needed there. Oh, and why are other locations (Frisbie & Harrison, for example) allowed to have crosswalks, but other locals not? We have painted a number of crosswalks and red curbs (to assist at keeping cars from parking and blinding intersections) over the years and most remained intact because they were clearly necessary and the neighbors did not report them to Public Works.